It´s not about Bruce Willis´ John McLane character but about the ZLB. The International Monetary Fund, having just downgraded its forecast for global growth, warned the assembled G20 attendees that yet another downgrade was pending. Despite this, all that emerged from the meeting was an anodyne statement about pursuing structural reforms and avoiding beggar-thy-neighbour policies. 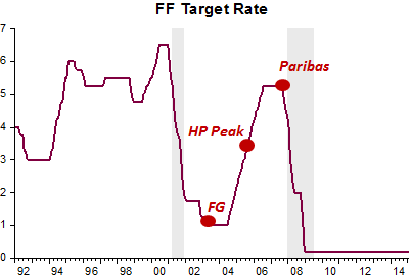 Once again, monetary policy was left – to use the now-familiar phrase – as the only game in town. Central banks have kept interest rates low for the better part of eight years. They have experimented with quantitative easing. In their latest contortion, they have moved real interest rates into negative territory. The motivation is sound: someone needs to do something to keep the world economy afloat, and central banks are the only agents capable of acting. 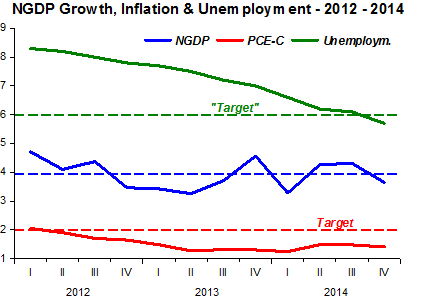 The problem is that monetary policy is approaching exhaustion. It is not clear that interest rates can be depressed much further. where μ is the Keynesian multiplier, τ is the tax rate, and φ is the hysteresis coefficient. It will then require a commitment of (r-g)ΔD percent of future output the service the additional debt, where r is the real interest rate on government debt and g is the growth rate of the economy. The debt service can be raised through explicit and fiscal deadweight loss-inducing taxation, through inflation–a tax on outside money balances accompanied by disruption of the unit of account–or through financial repression–a tax on the banking system but also imposes financial distortions. That is the simple arithmetic of expansionary fiscal policy in a liquidity trap. The question of whether and how much expansionary fiscal policy a government facing a liquidity trap should engage and then becomes a technocratic one of calculating uncertain benefits and uncertain costs. The Fed could and did cut rates, helping to cushion the impact of spending cuts. It can’t do anything like this now, because the Fed funds rate has already been cut more or less to zero in an attempt to fight the effects of financial crisis. Austerity right now is a really, really bad idea. They all “forget” that monetary policy is the “Bruce McLane” in this story. Larry Summers evokes monetary policy experimentation “in extremis”! But that´s the present situation, when everyone else has “given up” on it! 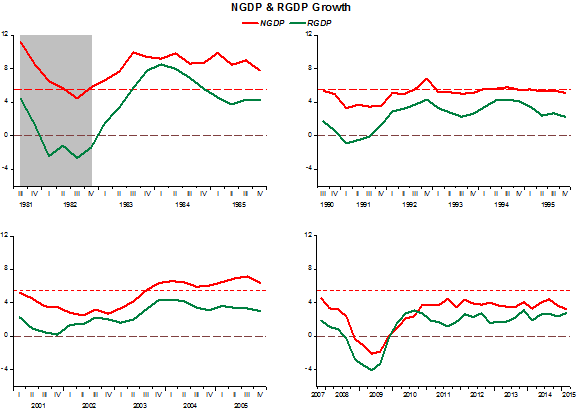 The charts below indicate, contra Krugman (and all ZLB advocates), that it was monetary policy as defined by NGDP growth, not interest rates, that allowed RGDP growth to come back robustly from the 1990/91 recession, even while government expenditures was being crushed. 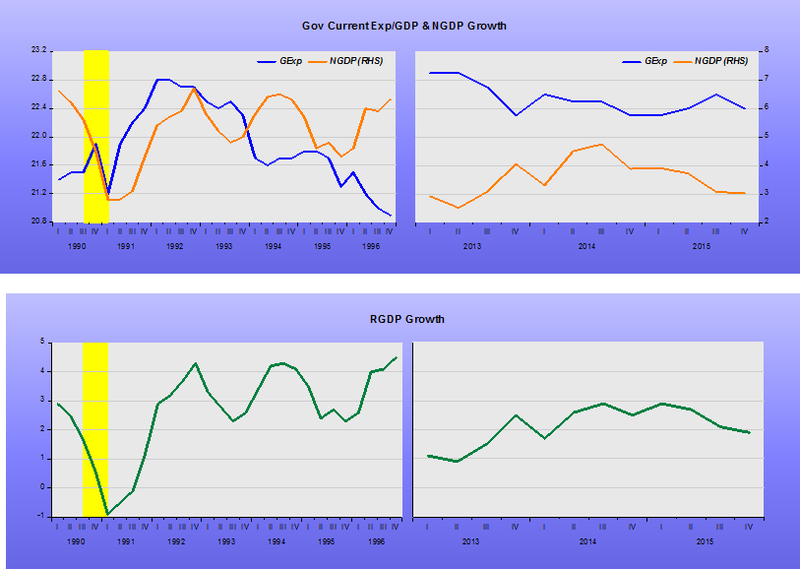 At present, tight monetary policy (despite extremely low interest rates), even if accompanied by relatively (to the 1990s) high government expenditures, is what keeps real growth compressed! On substance, the supply-siders have covered themselves in, well, whatever is the opposite of glory since 2008 — predicting runaway inflation and soaring interest rates, disaster from tax hikes both nationally and in Jerry Brown’s California, triumph in Brownback’s Kansas, and on and on. But starting the comparison in January 2011 is blatant cherry-picking to make high-tax California look good. What happens if we, more naturally, do the comparison from the cycle peak in December 2007? Things look very different, especially if you take into account that since 2007 California´s resident population has grown a little over 7% while Kansas has seen resident population grow only just above 4%! There´s no “disaster” and no “triumph”, just mediocre performance everywhere! Brad Delong has given the opening that Krugman needed to come out and explicitly say what he has only been implying for a long time: “We need bigger government”! What I believe governments could do much better, and cheaply, while avoiding becoming gargantuan and stifling, is to design better incentives for people to behave in a more ‘virtuous’ manner regarding the long-run. 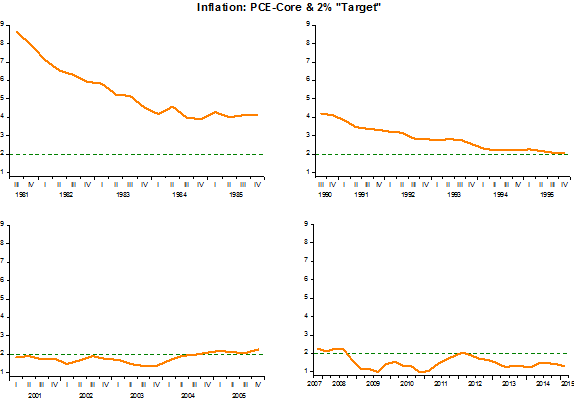 They were different in that the Fed had acquired credibility as an inflation avoider. 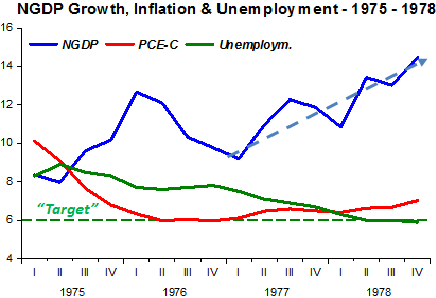 The 1990-91 and 2001 recessions were shorter and shallower than those that took place in 1973-75 and 1981-82. What distinguishes the 2007-09 “Great Recession” from ALL the others is that in 2007-09 the Fed allowed nominal spending to contract at a rate not seen by most living people. And the slow recovery is, symmetrically, due to the Fed keeping nominal spending growth on a leash (maybe all this happened because with Bernanke the Fed became an inflation “paranoid”). So you don´t need to appeal to “austerity”, the (horrible) conduct of monetary policy explains both the “deep dive” and the “slow-motion resurfacing”. PS. PK is repeating an old argument of his. And so am I! 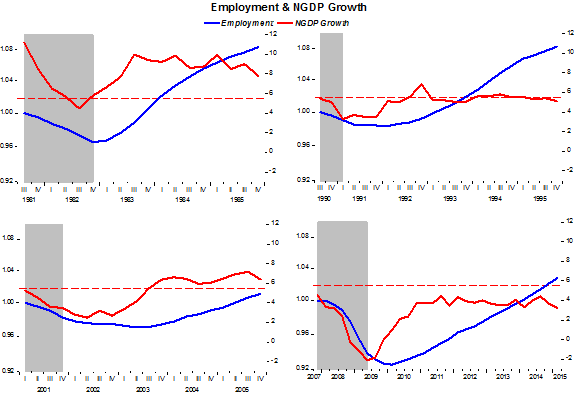 With job growth finally running at the pace we’d expect to see after a deep slump, we’re not hearing as much about how Obama’s anti-capitalist policies are the reason we’re not having a V-shaped recovery, the way we did under the Blessed Reagan. But it’s true that recovery was a long time coming. Why? Well, the answer has long been obvious: constrained monetary policy thanks to the zero sort-of lower bound, constrained fiscal policy because of the combination of debt fears and Republican obstruction. [A]t a time when monetary policy was limited in its effectiveness, fiscal policy was perverse. In practice, Reaganomics was far more Keynesian while Boehnernomics — which is what it ended up being, in practice — was anti-Keynesian. That’s the story of the delayed recovery. In his post Krugman concentrates on Government Purchases. That´s an incomplete measure of government contribution to demand. 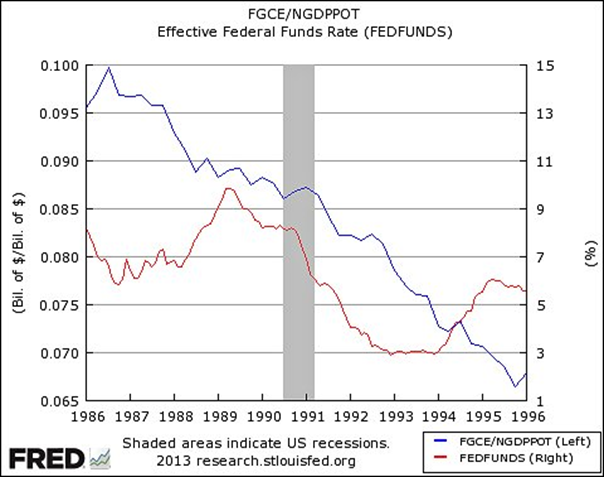 Better to look at the fiscal balance (in this case deficit of the Federal Government relative to GDP). 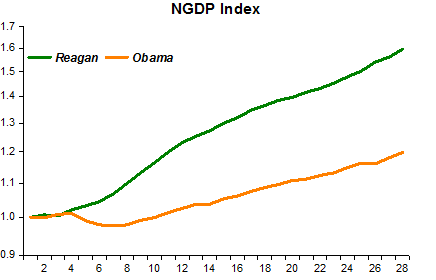 The chart shows that the pattern was similar, with the deficit increasing more during the Obama cycle. In cyclically adjusted terms (CA), the outcome is different, with the deficit taking a deeper and quicker “dive” under “Obama”. But what really provides the explanation for the contrasting recoveries is the behavior of monetary policy, not as (wrongly) inferred from levels and changes in the FF rate, but as reflected in the behavior of nominal spending (NGDP). And pointing to rising rates as monetary tightening (and falling rates as monetary easing). What’s worrisome is that it’s not clear whether Fed officials see it that way. They need to heed the lessons of history — and the relevant history here is the 1990s, not the 1970s. Let’s party like it’s 1995; let the good, or at least better, times keep rolling, and hold off on those rate hikes. 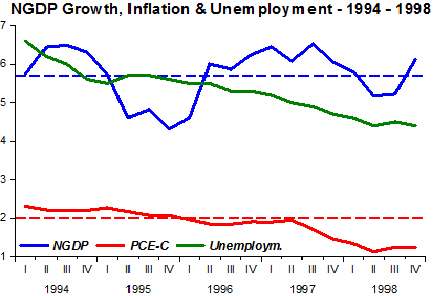 Note that policy is actually tighter in 1995 than average Fed behavior over the 1990s predicts. But what if the Fed followed Krugman’s advice and behaved like it did in the 1990s? 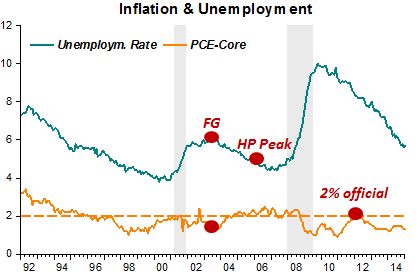 Well, the fitted Taylor rule, given an unemployment rate of 5.5% and a pce inflation rate of 0.2%, implies a fed funds rate of 2.8%. So if the Fed had been behaving like it did in the 1990s, it would have lifted off the zero lower bound long ago. Apparently Krugman is confused. Monetary policy in 1995 was not “tight”. Just as monetary policy today is not “loose”. 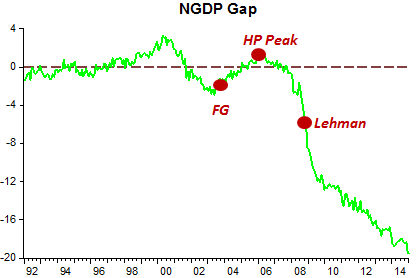 You get the appropriate answer by looking not at the change/level of the FF rate but by looking at NGDP relative to trend.